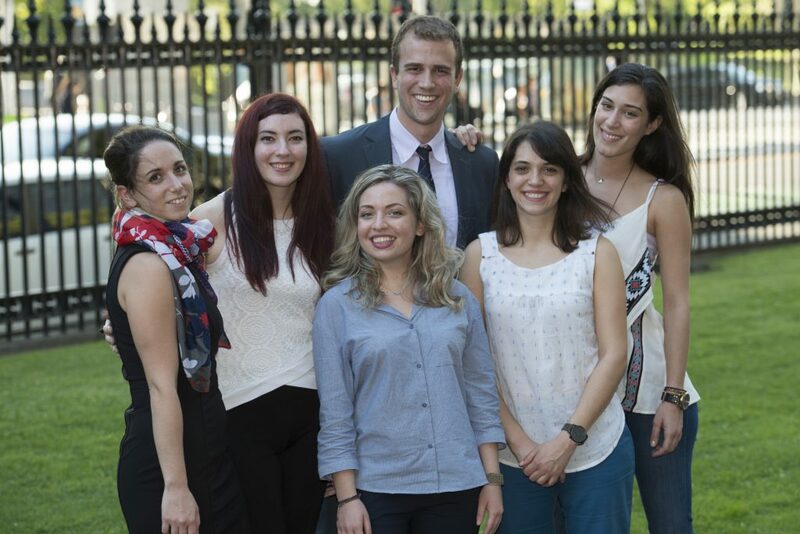 They came, they saw and they conquered – or at least, gained significant professional experience. The first team of interns who took part in The Hellenic Initiative program, which was started by prominent members of the Greek Diaspora, in order to provide an outlet for the Greek youth, struggling with the consequences of the crisis on an all but dead job market. Eight young people, skilled and educated, looking for work in the building and construction industry, in the banking sector and marketing, travelled from Greece to Australia to spend six months working for businesses in Melbourne, Sydney and Perth and gain experience that they wouldn’t be able to gain otherwise, due to the ongoing crisis that has diminished opportunity for young people. “Unfortunately, I could not find a job relevant to my studies in Greece, due to the high unemployment rate”, says Lena Zafeiriou, explaining the reasons behind her decision to participate in the Regenerate Program that liaised with the Hellenic Initiative to offer the paid internships. Having studied Business Administration at the University of Piraeus, she found herself working in any irrelevant sector imaginable: “I’ve worked for a human resources firm in various projects, as a health services salesperson, as a cashier at a fast food restaurant, as a waitress and as an extra in TV programs”, she says. “Apart from the fact that, each year, we have many more economists graduating than those who can actually get employed, the problem in Greece is that ‘marketing’ is associated with sales, which means that many employers take advantage of young people, making them work in sales, believing that this is marketing”. In Melbourne, Lena had the opportunity to develop her marketing skills, working with The Lonsdale Institute, an education and training facility providing courses for many foreign students. “It was a tremendous experience”, she says, happy that her positive first impressions were verified. “I worked at marketing and sales, as part of a small, but driven team, which included me from the start and encouraged me to take part in all the process. I did not do a ‘second-rate’ job, because I was an intern”. She intends on giving back to the Institute, as her plan is to open a satellite office of Lonsdale in Athens, to attract students from Europe. “Basically, I’ll promote the idea of studying in Australia, as a way to gain experience”, she says. “For us, as an educational organisation, to have someone from Greece come and take skills from us and understand what we offer and gain insight on what it means to live and work in Melbourne is very valuable”, says Lazaros Papassavas, director of The Lonsdale Institute, whose Greek background played a major role in the involvement of the school in the project. “My father had a significant role in the Greek Community of Victoria and I felt that it is important for us to keep these links to Greece”. Describing Lena as a “fantastic” worker, he admits that the opportunity has been ‘eye opening’ for him as well. “I probably had a preconceived idea of what I thought a typical Greek worker would be”, he says. “I was a bit jaded by the idea that Greeks are not working hard enough, and that’s how they got themselves in this economic situation, but I was proven very wrong. I met all the participants at the program and I was very pleasantly surprised”. According to him, there will be much more opportunities for Greek and Australian businesses to do work together. “Australia is fortunate to have a large Greek population and that gives Greeks a particular feeling of comfort, even though we are so far away. Greeks see more opportunity in Australia, thinking where Australia is economically, with a view to the rest of the world; it is becoming more and more attractive, at least as far as education is concerned. I think we’ll see more links as time goes by”. 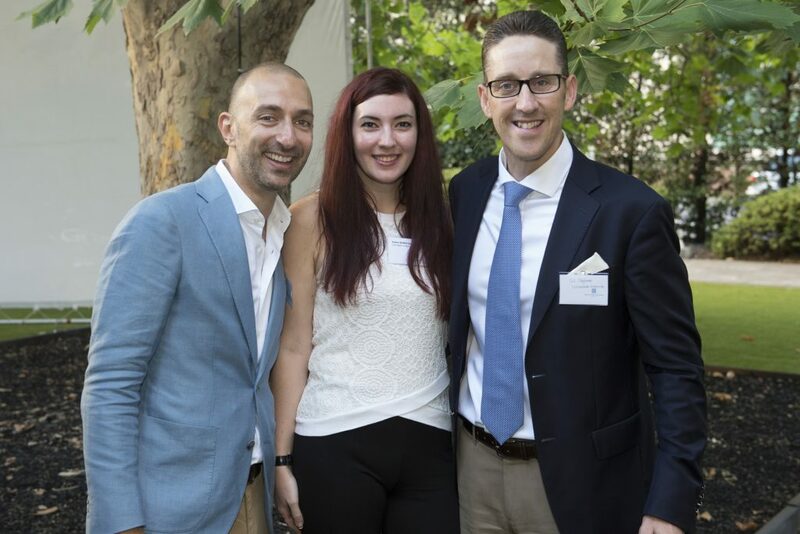 Lonsdale Institute Director Lazaros Papasavas and CEO Gil Polglase with marketing intern Lena Zafeiriou, who’ll work as a Europe representative of the Institute, opening a satellite office in Greece. This would prove to be very useful, as all the participants attest to the overall positive experience. “At first, my expectations were very low, as this was the first implementation of the program”, says Lida Christou, who worked as an intern at the Hickory construction company. “I also believed that it would be harder for me to respond to the demands of the job, as this was actually my first professional experience”. With a degree in Civil Engineering from the National Metsovian Polytechnic, Lena had confidence in her technical knowledge, but in Hickory group she got to acquire other sets of skills, necessary to the building sector. “While in uni, I learnt to read blueprints, but here I got to work on the financial aspect of a project, develop organisation skills, and learnt how to speak to suppliers and architects. I developed negotiating skills, something that you can’t be taught. I believe that universities in Greece should give more emphasis to this aspect and promote professional internships during studies, so that these skills could be developed”. With this kind of know-how in her baggage, she now returned to Greece feeling “lucky and grateful for this opportunity. I’m very glad that I got to live this – and that I manage to still get a glimpse of Greek summer”, she adds. What most interns agree on is that this experience, put them in the process of comparing Greece with Australia, even unwillingly. “I am not one of those negative people who blame Greece all the time”, says Elvira Vlassi. “Young Greeks are just fine, they’re just having a hard time. There are a lot of skilled and eager young people in Greece who have ideas and want to do things, but they are faced with adverse circumstance, a hostile political and social environment”. She herself was very impressed by the multi-cultural aspect of Melbourne, of the fact that “anyone can co-exist with anyone in the workplace and work together in harmony”, as well as the overall “feeling of prosperity”, that prevails in the city. “You can sense it by just meeting people. They are basically happy, they have emotional stability, and from then on they are in a position to do interesting things”. An Athens Economic University graduate, she got to work for NAB, at the business centre, doing a lot of support work, an experience that she says deeply influenced her. One of the things she wants to take back to Greece is the ‘no worries’ mentality: “If you make a mistake, it is not the end of the world, it is more important to take a risk, than following the safe path”. For Sotiris Pittos, who worked in the banking sector as well, as an intern for ANZ, the experience was equally significant: “I learned how to communicate with clients, how to position myself along other colleagues, how to work and not give up”. He is not hesitant to mention the difficulty he met along the way: “At first, I had a hard time understanding Australians. The combination of accent, abbreviations, and bank terminology, made it very difficult for me. But as soon as I identified the problem, I came up with a solution; I started studying so that I could assimilate”. This setback surpassed, he managed to adopt his colleagues’ mindset, regarding work. “This is now part of my own human capital, something that I can take with me to my next job”, he says. As for the next wave of interns coming to Australia through the Hellenic Initiative, Sotiris has a piece of advice: “Be open-minded, and willing to adapt to a rather different environment than what they are familiar with. If they do that, they will see that coming here is a very good idea. It will help them broaden their horizons, they will learn things, and speak better English. There is nothing but positive outcome”.